Exodus has over 40 years experience of designing and taking people on extraordinary adventures. Since first taking a group of travellers to the Himalaya over 40 years ago, the company has since expanded to offer in excess of 500 itineraries across more than 90 countries. And for the last 4 years we have been working with our client to help them speak to their audience in ways that help them rise above the competition – Exodus are not just a travel company, they’re expert travellers themselves who are passionate about designing unforgettable experiences that will help people make memories in all four corners of the world. In those 4 years, our relationship with Exodus has been about helping them constantly evolve, as the expectations of their audience also evolve. From the more traditional holiday brochure designs, we have played with variations in size and different innovative ways to display Exodus’ offering. And they have all demonstrated their effectiveness in a busy and challenging sector. In a bold move last year, we had helped Exodus go a step further and created not just a set of brochures, but a range of striking travel magazines that were a total departure in the industry, positioning our client as expert travellers helping other travellers go on the adventure of a lifetime. We achieved this thanks to our passion for beautiful travel magazine design and engaging content creation. Last year’s magazines were a commercial success for Exodus, and also received great feedback from their customers. The magazines even received double recognition at the Travel Marketing Awards. Not relying on past success, it was time to evolve again. Every year Exodus customers will expect to reward themselves with brand new adventures, sensations and experiences. And how they find out about what lies in waiting can be as important and exciting as the experience itself. So this time we had to create a set of magazines that – whilst still transmitting a sense of familiarity with the magazines that had inspired so many Exodus customers the year before – went a step further to guarantee renewed excitement and intrigue. The magazines communicate that this is just the start of the planning journey – a stepping board into inspiration and evasion before moving online or in-store to purchase the adventure of a lifetime. Before reaching that stage, the magazine designs offer Exodus customers the chance to sit back, relax and take it all in. 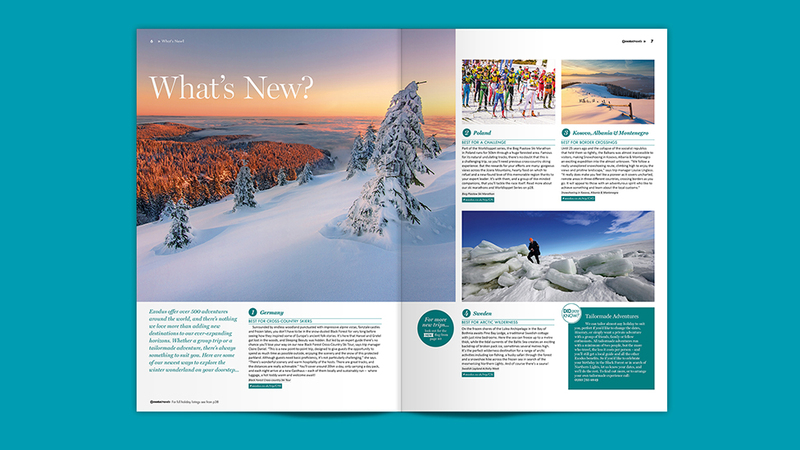 Our travel magazine design and content team advised Exodus on the best editorial content strategy – a variety of layouts, visual styles and ways to tell stories grab readers’ attention from the cover page. Warm and almost ethereal illustrations evoke the feeling of freedom and internal reflection that travelling and adventure inspire. Photography that evokes so much more than just a holiday, coupled with our copywriters’ engaging and journalistic style copy, entice readers to immerse themselves in the variety of articles available: stories from real Exodus travellers, recommendations from local guides and Exodus experts with first-hand experience, or features that may highlight what makes a particular destination different. Large striking photographs take over the magazine spreads inviting readers in. Captivating photography and strong headlines introduce readers to places they never knew they’d visit. 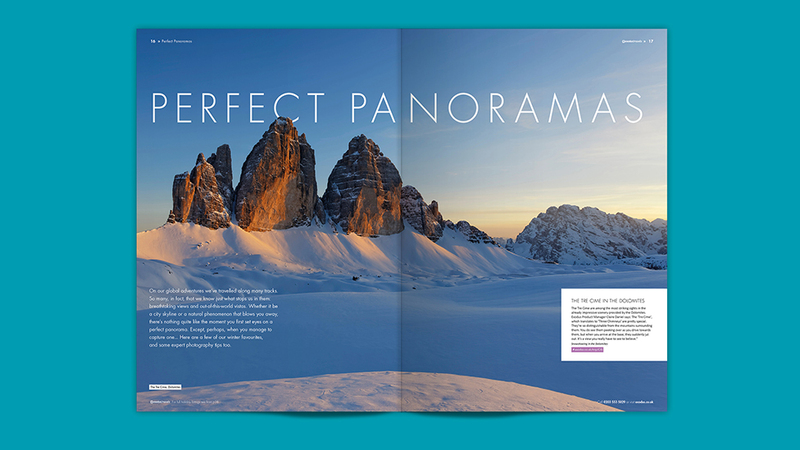 The travel magazine design also include spotlight features on different destinations across continents. Colourful maps and illustrations developed by our team add a playfulness to the magazines, contrasting perfectly with the striking photography-led pages. Detailed food pages speak directly to adventurous travellers who more and more seek to experience every nuance of distant destinations and cultures. Dedicated pages feature local producers, cooking demo experiences and even recipe ideas, giving a real flavour of what the experience is like even after the adventure’s over. The back pages of each travel magazine design are dedicated to price listings, informative yet still playful and engaging.